Fairly broad and sweeping language, isn’t it? Essentially, if the independent contractor agreement prevents a person from working in a particular area or field, it is probably not enforceable under this statute. Of course, there is the question of what it means to be “restrained” from exercising a law profession, trade or business. Does restrained mean any restraint, even reasonable means a business might take to protect itself and its investments? 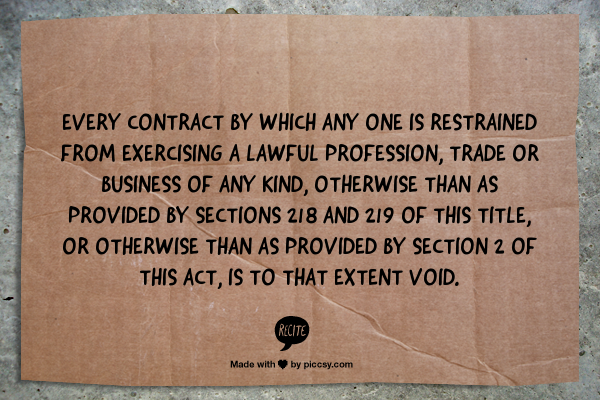 Does restrained mean a complete prohibition against a contractor working in an industry, such as pharmaceutical sales? Or is the answer somewhere in between? It turns out the answer is reasonableness. The fundamental question a court will ask about an Oklahoma non-compete agreement is whether it is a reasonable restraint on trade. The Oklahoma Courts have considered the question of using a non-compete to restrict an independent contractor and found it unenforceable. 6. Non–Competition. Representative agrees during the term of this Agreement and for a one (1) year period commencing on the date of termination of this Agreement, that in the (i) United States, (ii) State of Oklahoma and contiguous states, (iii) the Territory, during the term of this Agreement, including any renewals or extensions thereof, that it will not, either directly or indirectly, distribute, market, promote, solicit the future sale of, or sell, any medical device product competitive with any of the Spinal Concepts Products, or in any way have a financial interest … in any business engaged in the distribution, solicitation, promotion or sale of any medical device product competitive with any of the Spinal Concepts Products. In sum, if the restrictive Oklahoma agreement keeps the independent contractor from working in their chosen profession it probably will not be enforced.